"When you’re playing Fitness-Evolved it actually projects you into the game! You see yourself stood next to a virtual instructor. What’s more amazing is that as you follow the instructor through the movements Kinect tracks you’re movements and offers advice." As that review discusses, whether or not it's good at teaching you tai chi, is almost secondary. What this system is doing is popularising tai chi, and inspiring people, who might not otherwise do so, to "have a go". This game is not designed for a serious practitioner, (and indeed looking at these videos of the exercises, it seems that it is really chi gung rather than tai chi), but that is to miss the point. If these 15 minute xbox kinect tai chi workouts help to relax some people, then that is a benefit in itself. Tai chi snobs may turn their noses up, but really it is a way of demystifying these internal arts, and bringing it to the (western) masses. Hopefully some of these people will then go on to join classes and of course the more people who want to practice tai chi the better! 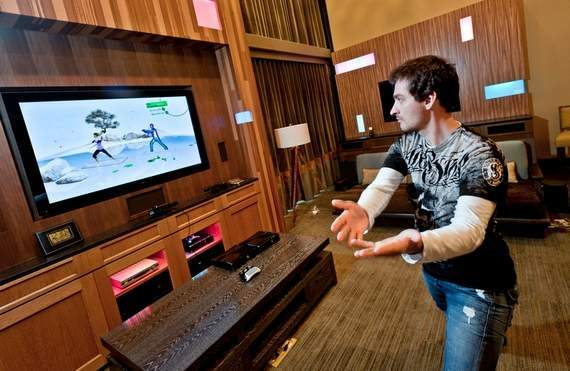 Researchers could design two different chi gung/tai chi/yoga workout programs to be performed using the kinect system. Volunteers could carry out the exercises daily for a period of weeks with the data recorded. You could also ask the volunteers a series of psychometric questionnaires throughout the trial. At the end of the trial what you would then have would be data on how people's emotions and moods were affected. You would also have data on how well/accurately the volunteers performed the tai chi moves. It would then be possible to compare the two groups of volunteers who each did different exercise routines to determine which one was better/worse. Serious chi gung practitioners will say that each of the different exercises is connected to a different meridian/element in Chinese theory and can help to balance and strengthen the associated aspects (including emotions) of that meridian/element. The kinect experiment I outline above, would provide empirical data on how different chi gung moves affected emotions to test these assertions. I would hope such testing would be welcomed by the chi gung community.